It always amazes me just how much of our living is dedicated to try and avoid dying. Every second magazine has some advert for something that will extend our lives, be that taking megavitamins or doing colonic washouts. I have dealt with the megavitamin myth recently, so I won’t cover that again today, but colonic washouts have been spared my pen dipped in hemlock - until now. Just how, pray tell me, does sticking 300 mm of garden hose up your fundamental orifice assist you to become more healthy? Let me assure you that the colon was designed to cope with human poo. It was not designed to cope with garden hose loaded with mystical ingredients that will make you live longer. Put the garden hose away. It will not work. However, we still all want to be immortal, so if your ambition is to live to be 100, the Okinawa Express is now leaving from platform number three. According to an article I have read, the Japanese Health Ministry claims that Okinawans have an average life expectancy of 81.2 years - 86 for women and 75 for men (note for the marriageable - choose an Okinawan woman 11 years older than you are and go for a double cremation). So what are the Okinawans doing right? Is it the center of colonic washouts? Or what is it that we are doing wrong? When you look at this conundrum, it is interesting to note that if you take the Okinawans out of Japan and relocate them in another culture, they end up with the same statistics as the culture in which they are now living. The same has been shown in comparative statistical examinations of all races, for all diseases. East Africans do not get tooth decay, but when working for British Rail (“Mind the gap!”) and living in the UK, end up with a set of typical British rotting teeth - or a fine set of NHS dentures (mind the gap, again!). The other factors associated with longevity - or the lack of it - cigarettes and booze, were not mentioned in the article - because I think it would be there that you would find another clue. Despite Uncle Ernie who lived to be 103 and smoked 60 cigarettes a day and drank a bottle of bourbon before lunch and died when shot by a jealous husband, we do know that smoking doesn’t help you live longer (when I typed that last phrase, I had inadvertently put “love” longer - but that’s true too). Like wise, we know that with alcohol, the middle way is also best. Has the Mistersingha person died? We haven’t had to put up with his ramblings for a while. Or have you been screwing his letters up and dropping them in the round file beside your desk? BTW, sorry to read that you got held up in Bangkok for the 15th party. Good stoush. Maybe next year? No, he hasn’t died, my Petal. Look at the letter below yours. And have you been snooping in my office, you naughty boy and saw my round file? You should be ashamed. Nothing’s sacred these days. Yes, I was sorry I missed the bash, but maybe next year? Pater is having a little difficulty with his high-rise condom! Despite having his “DUNBONKIN” sign displayed on his door, ladies still go tap, tap, tap as only ladies can! What can he do, apart from popping out for an extended whirdle? What did I do in my last life to deserve you? Please let me know when you put the “DUNLIVIN” sign above the door. It will probably happen soon, as whirdling at his age is almost as dangerous as frangulating. Please pass on my best regards to your carers. They have a very difficult job. I have an estate in the UK where I live for six months every year. My children are all grown up and are self supporting, and my wife is well covered in my will. The problem I am looking at now is the fact that I have invested in real estate in this country, and have a Thai friend who looks after my investment for me, collects rents and the like. I would like to make sure that he is looked after if I should die, and would want that my Thai real estate holdings go to him, and not my UK family which will be well off when I go, which I hope will not be too soon. How do I go about this, Hillary? Really it is not too difficult at all, but you have to follow Thai law in this situation. I cannot give you all the details, Petal, but a good Thai lawyer can. Ask around your ex-pat friends for names of recommended lawyers, and if needs be get advice from more than one. I would try to keep your two sets of beneficiaries as separate as possible. There’s nothing like a death to bring a family together – to fight about who gets what! Add in another set of beneficiaries and you have a real cat-fight. You have been asked about tipping before, but I cannot find the edition it was in. I realize that waiters look to the tip as part of their wages, but I just need to know how much should I tip them? Is it compulsory? I do not want to look mean, but I haven’t got thousands of baht to fritter away each time I go out. I appreciate your advice each week. Much depends upon whether the establishment includes the tip, called Service Charge, in the bill. Many hotels have the signs + + after the price, and this means plus service charge and plus VAT. Since they have already factored in (usually 10 percent) for the tip, then there is no point in tipping twice. Some people say that the establishment pockets the service charge and does not give it to the waiters and waitresses, but that is something between the employers and the staff, nothing to do with the diners. If the restaurant does not include the service charge, then around 10 percent is fair enough, unless you have had lousy service, or no service. In those cases, do not tip at all. In fact I have been known to wait for five baht change just to show them that I only tip for good service. If the service has been exemplary, with lots of fawning and scraping to make me feel wonderful (flattery gets them everywhere) then I will tip more than 10 percent. I’m not stingy. 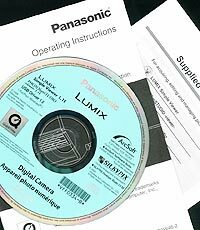 When all else fails - read the instruction manual is always some good advice, and the answer to many photographic problems can be found between its pages. I have written before about just how much information there is available, if you want to look. Unfortunately, many instruction manuals are close to being useless as the details are too difficult to understand (or ‘navigate’) these days. Is this you? Be honest now. I have this problem too. The family happy snapper is a Canon Ixus 40 and after one or both of the children play with it, the LED screen ends up with all kinds of confusing icons and histograms. How to return it to the simple turn on and take pictures mode is beyond me, and beyond the capabilities of the instruction manual to impart. Fortunately, the store where we bought it has a bright young man who races through menus and gives us back a camera we adults can use. And he does it free of charge. What a bargain. Now a few weeks ago I published a letter from Darcy in Australia who had written to me with his problems with a new Nikon D 40 X he had purchased. His first digital camera, and welcome to the wonderful world of drop-down menus, while just wanting to snap drop-dead models. This prompted Don Griffith to write to me with some advice for young Darcy. And as it was extremely sage advice, I have reprinted the letter below. “Darcy’s problem with the Nikon D40X has prompted me to pass on a tip. I have a D40 and probably the instruction manual for it is exactly the same as his. Very badly laid out and confusing - vague language and far too many cross references for someone making the transition up to a DSLR to make total sense of. “To this end it is very worthwhile investing in a third party book on the camera if one wants to get the best out of it. “I got one from my local ‘Amazon’ - the beauty of using Amazon being I was able to read parts of it before I bought it to make sure I was not buying yet another confusing instruction book. I bought the cheapest available out of a surprisingly large collection that was on offer - and it has been a complete revelation and consider it has totally paid for itself in the first three or four chapters. “For example, I have had the camera for 12 months and in the first chapter or so I learnt basic things that I was previously unaware of - like how to use the exposure compensation/aperture button. With today’s increasingly more technical (electronic) cameras, you do need a good manual, and if the factory one is too complex, then I suggest you do as Don Griffith has done. Look for the easier after-market publications. As everyone knows, what goes up must come down. This is equally applicable to a certain item of clothing as it is to fund prices and share performances. The biggest and, supposed, best make as many poor calls as the rest of us mere mortals. For example, Goldman Sachs (GS) had Marks & Spencer (M&S) as a ‘Buy’ recommendation from when it was priced at 745p. They finally realized that this was not the brightest option when they recently removed the aforementioned tag when it was at 235p. So, if someone had taken the advice when it was given in May last year they would have lost over 68% of the money invested. However, GS were not the only ones with egg on their faces. Investec still had M&S as a ‘Buy’ when it was at 230p. This is from the same people that recommended Sub-prime to us all and look where that got us. The research done on this was a tad poor to say the least and many of the investment companies’ managers looked at the potential size of their bonuses as opposed to their clients’ wallets. Anyway, I digress. Back to market timing. Another classic is what happened to the Legg Mason Value Trust. Over the last ten years this has consistently outperformed the S&P500. However, in the space of six months, it is now lower than its benchmark and people are now left with the same amount as when they originally invested in 1998. This just goes to show that nothing keeps on going up for ever and that those who invested recently will be ruing the day they did. It also shows that fund managers that rely on growth in assets under management for a source of income as opposed to value delivered (i.e. the vast majority of them) are extremely vulnerable to their own success. Another good example of this is the old Fidelity Magellan Fund which at it’s height a few years ago had over USD100 billion in it. Regular readers of this column will know that, with honourable exceptions like Man Investments, we prefer active funds that are hungry for success. This is because, as can be seen from above, excessive size is a real problem when trying to achieve continued investment success. It behooves investors to select a manager who has no loyalty to anyone but the investor who has elected to put money into that fund. It will sort out the men from the boys and those that manage to survive this bear market will emerge leaner, meaner and a lot stronger. Not all fund managers are greedy incompetents but a lot of the managers are managed by their companies and told that profits for the company are more important than those of the investor. As stated above, I cannot emphasise strongly enough that if you do own funds then you will do a damn sight better by going with a high quality fund manager than just picking a large well-known one. Many fund managers are also limited in what they can do by the make up of the fund itself. If the fund insists that it can only invest in equities then that is it. There is no facility to allow the manager to jump into alternative funds, commodities, property etc. There is the crux of the matter, as the real challenge now is actual asset allocation - especially having the ability to move money away from any particular area where it may be vulnerable. Just to show how bad the markets have had it this year you only have to look at the chart on this page. 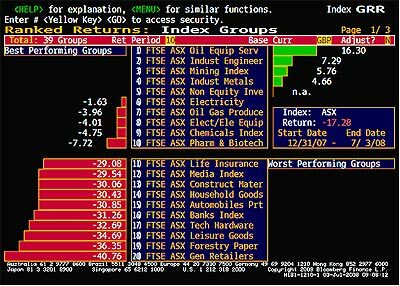 Sector after sector shows massive losses with the only ones not suffering are those industries linked to commodities. This is just the FTSE All Share but it is equally applicable to any major market in the world right now. The world is a different place now than it was recently. What to do? 1. Do not tie money up in something that you cannot get out of relatively quickly - especially in the equity market. 4. If you have not already done so then it is a good time to consider getting into good quality absolute return funds with a multi-asset class approach. 5. If Option 4 is still too aggressive for you then there is always that option called … Gold. What all of this basically amounts to is that nobody, not even Warren Buffet, can time individual markets or stocks. Even if you could then it would not really help that as much as 90% of returns comes from asset selection, i.e., market timing at asset selection level just does not work and can be very expensive. Asset allocation, however, is a form of market timing and results in almost all of the growth your portfolio will make. A delightful evening…was certainly enjoyed by all those who went to the recital room of the Shangri La Hotel last Sunday. The occasion was the aptly titled La Bonne Chanson, with music by Debussy, Ravel and Faure played by pianists Jonas Dept and David Wilson (as a fine and selfless accompanist) and sung by tenor Antoine Garth, who displays a powerful and ‘actorish’ presence and technique well suited to these wonderful songs - especially the Five Poems of Baudelaire. Dept reprised two works from a recent AUA concert, although he seemed marginally less at ease in the acoustics of the new hall, which is very comfortable if slightly ‘dry’. The audience went on to the hotel buffet restaurant and it made for a friendly and chatty ending to a pleasant evening, reminding - if we need it - how lucky we are to live in the civilized environment of Chiang Mai I look forward to further events at this venue as well as the many concerts and recitals planned between now and the end of the year, including the second in the Faure Festival, towards the end of September. Less delightful…is any attempt at walking in Chiang Mai. Why I wonder are pedestrians - of any age - relegated to being second class citizens. True, I drive a car and have access to motor cycle pillions but like most people I choose to walk in town and to and from shops, to friends, restaurants and so on. The pavements in general are worse than a disgrace, they are positively dangerous - not least when used by cyclists, including the motorized ones. I challenge any member of the Highways Department of the City to walk down Huay Kaew Road from Amari Rincome to opposite Central and to try to cross the road in that area or - worse still - around Thapae Gate and tell me that they did not find it irksome and dangerous. Pedestrian crossings are part of an obstacle course. Smart surrounds to the Moat are fine as are plans for a park and other green areas, but the basic infra structure matters too. And can someone tell me why the elephants and their begging masters are around town again. I thought they had been banned. Even less lucky…are the Burmese people, ‘celebrating’ the twentieth anniversary of their 1988 uprising in the shadow of the brazen political posturing of the Chinese as they mount their preposterous and inflated Olympics. Rightly, President Bush and especially the First Lady mounted a verbal assault on the generals in Burma and laid much of the blame with China for their support of that vile regime as well as those in Zimbabwe and the Darfur region. Of course they are hardly exempt themselves and it is a good moment to reflect that - according to Amnesty International - China executes more people than in all the other countries of the world combined. Months ago, there was much talk of a boycott of the so-called ‘games’ and now that’s forgotten. Fortunately not by everyone and for myself and many others the sooner it is all over the better. Who cares given that it is an artificial contest engineered by excessive training, brainwashing and - no doubt - drugs and stimulants. And finally…a couple of weeks a go I wrote about music in Chiang Mai and elsewhere and mentioned that I had passing sympathy with Noel Coward’s view of Mozart’s music. It was remarked to me by a musician that not everyone would know what he said in his rather blatant generalization. Forgivable I suppose because Sir Noel was a man of enormous talent (if not genius) with a nice turn of phrase. So here it is, as far as I know, accurately rendered: ‘Mozart’s music is like a poodle piddling on flannel’. Mentioning generalizations, I’ve been criticized for those and for being unkind to various nationalities (including my own I add in defense). Ghastly to Germany, horrid to Holland, frightful to the French, insulting to Italians, even worse patronizing to Americans. So in future no words of sarcasm or criticism for anyone excepting those dour Scots and the class conscious English. Naturally, that does not exempt those ‘in charge’ of the countries mentioned. WALL•E: US Animation/ Comedy/ Family/ Romance/ Sci-Fi - WALL•E is a work of genius from the first frame to the last. Robot love in a dead world, and the cutest love story in years. There’s virtually no dialogue for the first 40 minutes; you’ll be enthralled. And the brilliant animation continues throughout the closing credits, as we’re treated to a continuation of the story in a series of historical art styles, from cave painting to Van Gogh. Reviews: Universal acclaim. Where the Miracle Happens: Thai Drama - Make no mistake, this is a powerful plea for compassion towards neglected segments of Thai society - the uneducated and exploited people, many hill-tribe, that are not really citizens of Thai society. It’s a plea for giving everyone living in Thailand at least the opportunity for education and health care, and freedom from exploitation. Produced by HRH Princess Ubolratana, this film is a drama adapted from a story in her book, “Short Stories from My Thoughts.” The Princess also stars in the film as a successful businesswoman who loses her daughter in a car accident. To fulfill the philanthropic wish of her child, she travels to a remote school in Chiang Rai (the film was shot in Chiang Mai) and tries to help the rural teachers rebuild their local school. The message is clear: those who have the means - the riches from the Thai economy - need to take a paternal interest in the country as a whole. It’s one’s responsibility, and is simply the decent thing to do for a country that has been good to you. This film is a part of Princess Ubolratana’s “Miracle of Life” project, which aims to provide education to underprivileged children in Thailand. It’s a heart-felt plea, told in basic and simple dramatic terms, with the standard ingredients of Thai drama and comedy fused into a quite moving film. The Princess acquits herself beautifully as the prime actor of the film. The production values are top rate - the photography is luscious. Rogue: Australia/US Thriller - An American journalist on assignment on a tourist river boat in the Australian outback which encounters a man-eating “rogue” crocodile. A modest and effective thriller, with some extraordinary shots of the breathtakingly-forbidding Australia harshness, accompanied by some quite excellent music throughout by François Tétaz which captured for me the beauty and danger of the location, and which includes in its mix aboriginal vocals and didgeridoo droning. The whole is a sort of study of crocodiles and crocodile lore by the director/writer Greg Mclean, who seems to really love the subject, and who seems very fond of the Northern Territory landscape. Rated R in the US for language and some creature violence (some of which has been clipped by the paternalistic Thai censors). Early reviews: Mixed or average. Shaolin Girl: Japan Action /Comedy - A sequel to the popular Hong Kong film Shaolin Soccer, about a girl who returns to Japan after spending 9 years in training to beat a master of Shaolin Kung Fu in a lot of fake fighting. All reports indicate it’s a pretty mediocre film, but it’s shown only in a Thai-dubbed version, so you won’t likely be seeing it anyway. The Mummy: Tomb of the Dragon Emperor: US/Germany/Canada Action /Fantasy - What a shame! All the talent, all the fantastic attention to detail, wasted on a mess of a movie that is nothing but one bang after another, one explosion after another, one bloody fight after another, all to no purpose. Ignore this one, unless of course you like mindless action, and the rest. It’s a ludicrous tale in which Brendan Fraser and Maria Bello play British aristocrat-adventurers who head East and meet up with their son (Luke Ford). The three bring to life the mummy of China’s ruthless Dragon Emperor and his vast terra cotta army. Hanuman: The White Monkey Warrior: Thai Action - Utter trash, and the biggest argument yet for imposition of censorship, let alone a rating system. Not only not fit for kids; not fit for adults either. Detailed beheadings with close-ups of the surprised looks on the faces of the decapitated heads, loving depictions of skin being slowly ripped off of humans, and worse. All involved should be heavily fined, and jailed. Death Race: US Action/Thriller - The most twisted spectator sport on earth as violent criminals vie for freedom by winning a race driving monster cars outfitted with machine guns, flamethrowers, and grenade launchers. The previews are the most repulsive imaginable. The Coffin: Thai Horror - Ananda Everingham as a claustrophobic architect who nevertheless participates in obscure coffin rituals. Last Saturday, I played in the annual individual tournament at the historic old club in Muang Som-mut. There were 24 entrants and everyone played two hands with each of the other players, for a total of 46 hands, leisurely spread over the day. Coming into the final two hands, the bridge gods had been kind to me, and I had hopes of winning the tournament. My partner for the last two hands was my old friend Robert the Rules. His nickname comes from his love of rules, at the bridge table and in life. He never fails to cover an honour with an honour. Last week I described how I finally got him to stop always playing third hand high. When there is an honour in dummy, he adopted the new rule that I taught him - keep an honour to beat an honour in dummy. Robert dealt and passed. South also passed. I preempted with a 2 spade call. Purists might object to a weak two with such a poor hand and bad suit, but with my partner having passed, I wanted to get in the way of the opponents’ bidding to the maximum extent possible. North doubled for takeout, presumably intending to bid a red suit or no trump if partner bid clubs. Robert correctly raised the barrier by going to three. But North, with his 19 points, was undeterred and doubled again. South bid 4 hearts. Non-vulnerable, I pushed to 4 spades, which has a play for only one down. North, hoping South was void in spades, went to 5 hearts. I passed, hoping we had pushed them too high to make. I led the jack of spades. Dummy ducked. Just looking at dummy and East’s cards only, what card would you play from the East hand? Robert, seeing the king in dummy, ducked. South, a fine Thai player, took the first trick with the queen and led a club, won by Robert. He returned a trump, ducked to my king. I led another spade, trumped in hand. South then led a trump to dummy, and ruffed the last spade in hand. By now, dummy was all winners and he claimed 11 tricks, losing only the ace of clubs and the king of trumps. I pointed out to Robert that he can count spades. He can see six in his own hand and dummy and he knows that I have six from the bidding. Therefore, he knows declarer’s queen is singleton. All he has to do is take the ace on the first round and we will defeat the contract. He had been so pleased with himself for remembering to keep an honour to beat the one in dummy, and was so crestfallen when I criticised his play, that I did not have the heart to say more. Getting Robert to think about the play, instead of following a rule blindly, was a hopeless task anyway!